Stress often comes from situations that are beyond our control—such as preparing for a meeting, waiting for test results, or arguing with a loved one. But we can control our response to these everyday tensions—through the wisdom and practice of Stoicism. Stoicism is an ancient pragmatic philosophy that teaches us to step back, gain perspective, and act with intention. 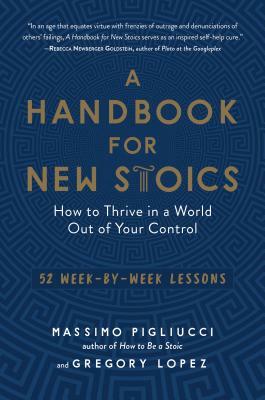 In A Handbook for New Stoics, renowned philosopher Massimo Pigliucci and seasoned practitioner Gregory Lopez provide 52 week-by-week lessons to help us apply timeless Stoic teachings to modern life. Whether you’re already familiar with Seneca and Marcus Aurelius, or you’re entirely new to Stoicism, this handbook will help you embrace challenges, thrive under pressure, and discover the good life! Massimo Pigliucci, PhD, is the K. D. Irani Professor of Philosophy at the City College of New York. His books include How to Be a Stoic: Using Ancient Philosophy to Live a Modern Life and Nonsense on Stilts: How to Tell Science from Bunk. He has written for The New York Times, The Wall Street Journal, and the Washington Post, and he blogs at patreon.com/FigsInWinter. Gregory Lopez is the founder and facilitator of the New York City Stoics Meetup, and cofounder and board member of The Stoic Fellowship. He is also on the team for Modern Stoicism, and co-facilitates Stoic Camp New York with Massimo Pigliucci. In addition, he is lead editor for Examine.com and editor in chief of the Examine Research Digest.